Tyler grew up in Port Alberni, Vancouver Island, British Columbia, where he developed an early interest in geology and mineral exploration. After graduating from Alberni District Senior Secondary school in 1997, Tyler completed an Honours degree in Earth and Ocean Science at the University of Victoria, graduating in the spring of 2002. During his undergraduate degree, Tyler worked as a junior geologist at the Yoho-Burgess Shale Research Foundation, at the British Columbia Geological Survey, and in mineral exploration for several summers at Westmin-Boliden Limited's Myra Falls operations (now owned by Breakwater Resources). Tyler's Honours thesis research involved a fluid inclusion study of the Eocence Metchosin Igneous Complex (MIC), the goal of which was to determine whether or not fluid inclusions of the MIC recorded both sea-floor hydrothermal processes and emplacement metamorphism related to the accretion of the MIC to the North American margin. Immediately after completing his undergraduate degree, Tyler conducted regional mapping in the Stewart River area, Yukon Territory, for two field seasons as part of his M.Sc. research under Dr. Stephen Piercey of Laurentian University, and the Geological Survey of Canada's NATMAP program. Tyler's M.Sc. 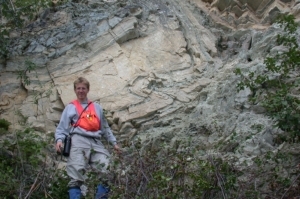 research utilized Middle and Late Paleozoic granitoids of the Yukon Tanana terrane (YTT) in order to understand the tectonic evolution of the terrane throughout the Paleozoic, and determined whether or not Paleozoic granitoids of the Stewart River area were capable heat engines for generating volcanogenic massive sulphide (VMS) deposits similar to those observed in the Finlayson Lake VMS district. After completing his M.Sc. thesis at Laurentian University in 2004 ("Petrology and Tectonic Significance of K-Feldspar Augen Granitoids in the Yukon Tanana Terrane, Stewart River, Yukon Territory"), Tyler accepted a consulting position with Cambria Geosciences of Vancouver, B.C., during which he had the opportunity to work with many different junior mining companies on volcanogenic massive sulphide (VMS) exploration projects throughout British Columbia. In January, 2007, Tyler began ongoing research for his Ph.D. thesis ("Stratigraphy and Tectonic Setting of the Sicker Group and Contained VMS Occurences, Vancouver Island, British Columbia") under Dr. James (Jim) Mortensen at the University of British Columbia. After completing his Ph.D. research, Tyler plans to pursue a career combining mineral exploration with further investigations into the relationship between Cordilleran tectonics and metallogeny. The Middle Paleozoic Sicker Group (SG) on Vancouver Island is believed to record the evolution of an oceanic island arc that represents the basement of Wrangellia. The SG is exposed in several structural uplifts on Vancouver Island and the Canadian Gulf Islands, including the Buttle Lake, Bedingfield, Nanoose and Cowichan Lake uplifts and potentially portions of the Westcoast Crystalline Complex. SG strata in the Buttle Lake uplift host the producing Myra Falls volcanogenic massive sulphide (VMS) deposit, the largest producing VMS deposit in western Canada. Other VMS occur throughout the SG in the Cowichan Lake and Bedingfield uplifts, and in possibly correlative rocks of the Westcoast Crystalline Complex. A paucity of isotopic and fossil age control, and lack of a detailed understanding of the stratigraphy of the SG, has impeded the development of a robust model to explain the origins of Wrangellia and hampered exploration for stratigraphically controlled VMS mineralization. Our research combines geological mapping with geochronological, biostratigraphic, isotopic, and lithogeochemical studies to better understand the tectonic history and metallogeny of the SG. New geological mapping of key parts of the SG is aimed at better constraining stratigraphic relationships within the SG, and in particular the geological setting of VMS deposits. We are employing U-Pb and Ar-Ar dating of intrusive and extrusive rocks as well as microfossil (radiolarian and conodont) biostratigraphy of sedimentary units to develop a coherent chronostratigraphic framework for each of the SG uplifts. Whole rock lithogeochemistry together with Nd and Hf isotopic studies is being used to constrain the petrogenesis of SG magmatism and test for possible linkages to continental (possibly Laurentian) crust. Lead isotopic compositions of sulphide occurrences are being used to discriminate between syngenetic or epigenetic occurrences, in order to evaluate the potential for additional large VMS deposits in the SG. Results of the study will enhance our knowledge of Wrangellian tectonic evolution and metallogeny, and lead to a better understanding of a critical part of the history of crustal growth in the North American continent. This research is conducted with Dr. James (Jim) Mortensen (University of British Columbia), and Dr. Fabrice Cordey (University of Lyon, France) and is jointly funded by Geoscience BC, Bitterroot Resources Ltd., Paget Resources Corporation, Treasury Metals Ltd., Westridge Resources Inc., and the Natural Sciences and Engineering Research Council of Canada (NSERC).